Posted by Luke Dorny on June 29th, 2009. Interesting article but Steve Jobs was not “kicked out;” he resigned after Board of Directors favored CEO Sculley’s policies over those of Jobs. Posted by S.R. Hershey on June 29th, 2009. Posted by bb on June 29th, 2009. Posted by pedro on July 17th, 2009. Posted by Como seria o site da Apple há 26 anos | Megafono on July 17th, 2009. Posted by Apple.com em 1983 / blog.ftofani.com on July 17th, 2009. Posted by Como seria o site da Apple em 1983 « Geeknologia – Jornalismo Digital e uma pitada de nerdice on July 17th, 2009. Posted by Como seria o site da Apple em 1983? | InsideTechno on July 17th, 2009. 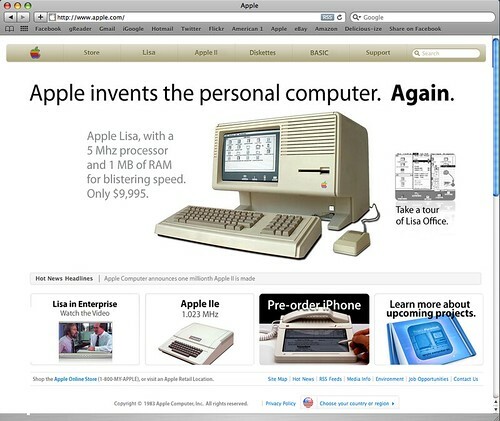 Posted by Apple Innovates Like It’s 1983 in Back-to-the Future Homepage | Technology News on July 17th, 2009. At least the Lisa had Cut & Paste when it was first released – unlike the iPhone – 25 years later! Posted by Fred on July 17th, 2009. “Hz” not ‘hz’ but very funny! Posted by ged on July 17th, 2009. Posted by Enjoy Apple’s Back To The Future Homepage Circa 1983 | Technology News on July 17th, 2009. Posted by Enjoy Apple’s Back To The Future Homepage Circa 1983 | Mac Bargains on July 18th, 2009. Brilliant. I love the “Pre-order iPhone” part. Posted by Allan on July 18th, 2009. Posted by Enjoy Apple’s ‘Back To The Future’ Homepage Circa 1983 | Cult of Mac on July 18th, 2009. <asking myself where that vertical scrollbar is going to end. anyhow: great job! Posted by Carl Risma on July 18th, 2009. That is a really fantastic mockup :-). I am really keen on Macintosh and computer history in general and I’m seriously considering putting a retro section in my website. Would I be able to use your graphic possibly as an introduction to that section? I can fully appreciate if you don’t really want me to do that, but it’s just so great, personally I don’t have the skill to create such a masterpiece! Posted by Malcolm Cameron on July 18th, 2009. Thanks Malcolm. Feel free to borrow the image (click on it for the Flickr link). All I ask is for credit and a link back here. Deal? Posted by davelawrence8 on July 19th, 2009. Posted by Enjoy Apple’s ‘Back To The Future’ Homepage Circa 1983 | Datensklaven on July 19th, 2009. Jobs’ resignation was a mere formality. He had already been removed as head of the Macintosh group and stripped of any power with in the company. Posted by Mike on July 19th, 2009. Posted by Enjoy Apple’s ‘Back To The Future’ Homepage Circa 1983 | Mac Bargains on July 20th, 2009. Posted by jardenberg kommenterar – 2009-07-21 — jardenberg unedited on July 20th, 2009. Posted by Newton Poetry — Biggest day ever on July 21st, 2009. Great retro-page. Of course, the internet was available, but not the Web 1983. Also, Apple were using a serif font during the 1980s. The iPhone black-and-white display isn’t so far off the mark, Apple designed the semi-portable Apple //c in anticipation of it using an 80×25 character LCD (or was it 40×25?). Apple’s professional development was done in Pascal, not Basic in 1983 (most of Lisa’s code was written in Pascal and UCSD Pascal was available for the II). Posted by Julian Skidmore on July 21st, 2009. Posted by Apple.com anno 1983 « Fosfor on July 22nd, 2009. Posted by Apple-Website 1983 < information superhighway on July 24th, 2009. Posted by Apple.com anno 1983 at Geeker on July 27th, 2009. Posted by Cosas que andaban por mi reader. « Soy un curioso on August 2nd, 2009. Posted by Marketing Eficiente » Blog Archive » Cosas que andaban por mi reader. on August 2nd, 2009. Posted by Apple.com circa 1983. « Ben Cheney is a curious thinker. on August 3rd, 2009. You totally can go and see what apple’s homepage looked like through the years. Just go to http://www.archive.org and type apple.com into the ‘wayback machine’ and it will give you hundreds of archived pages from years past. Posted by PodZ on August 3rd, 2009. Posted by desaturated on August 5th, 2009. Posted by Newton Poetry — Apple.com, circa 1993 on January 11th, 2010. Posted by Newton Poetry — More retro Apple.coms on January 20th, 2010. Funny how they threw my fake one in with all those fun real ones. Thanks for sharing! Posted by davelawrence8 on September 9th, 2010. Posted by Cool Apple images - Da Fresh News of Hollywood, Bollywood, Gadgets, Movies and Life Style on March 7th, 2012.